In the current climate when the rights of some have started to be eroded, the impact of this potentially affects us all, regardless of circumstance, background or status. Growing numbers of people are disadvantaged by complex rather than binary issues such as estranged adults, affected by issues of sexuality, ethnicity and so on. As our rights are interdependent and interrelated, it is vital now more than ever that we stand together. 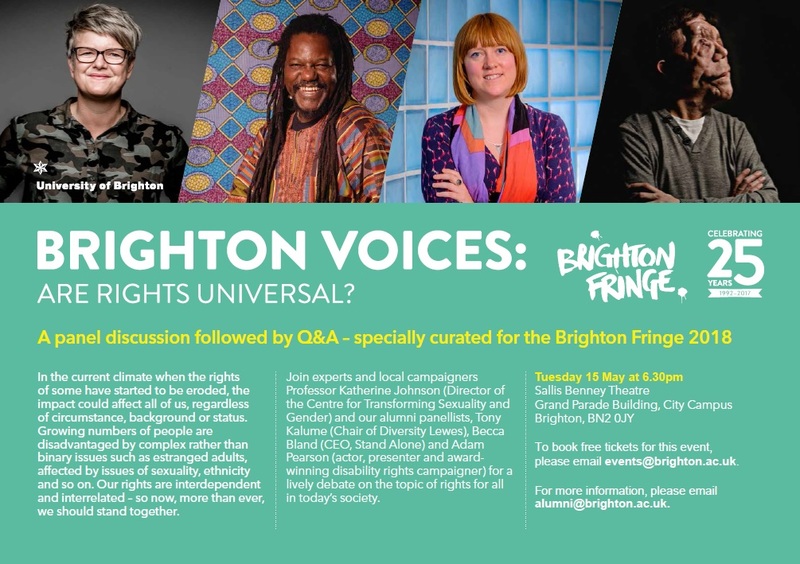 Professor Katherine Johnson (Director of the University of Brighton’s Centre for Transforming Sexuality and Gender) was joined by our alumni panellists, Tony Kalume (Chair of Diversity Lewes), Becca Bland (CEO, Stand Alone) and Adam Pearson (actor, presenter and award winning disability rights campaigner) to share their perspectives on the topic of universal rights in today’s world, before opening up the discussion to the audience of students, staff, alumni and local community members. 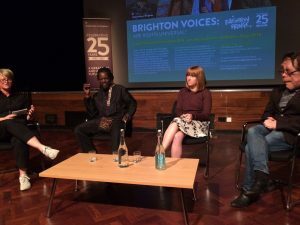 Following the success of our first two Brighton Voices events, we will be organising more in the coming months focussing on other important and timely topics. 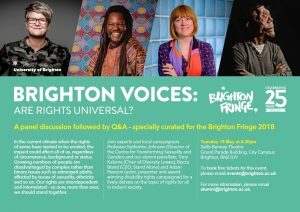 If you have any suggestions for topics we should cover and/or if you would like to be a panel member for a future event, please contact alumni@brighton.ac.uk.